A couple of months ago I had the pleasure of meeting the talented Kirsten Gilmour, the owner of The Mountain Cafe in Aviemore and the author of The Mountain Cafe Cookbook , and her lovely publisher at Kitchen Press, Emily Dewhurst. Although Kirsten had generously brought along a veritable buffet of delicious baked sweet treats to her book signing, I couldn’t eat any of it because days before, I’d eaten a meal which included onion rings, had a horrible IBS reaction that evening, and then after some research that night I began the low FODMAP diet exclusion period the day after. 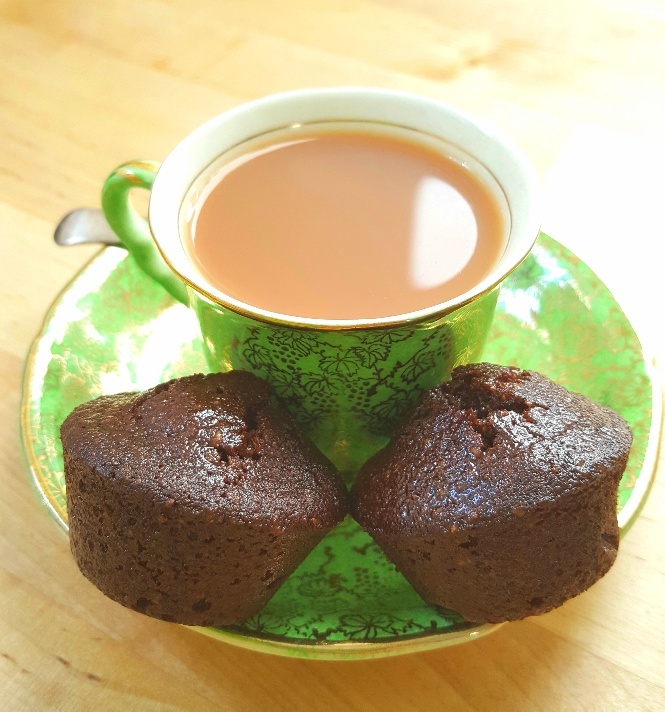 However, I had a great chat with Kirsten and Emily about trying to live gluten-free and Emily very kindly emailed me a cracking recipe for gluten-free almond financiers the following day. She’s so nice! I’ve never had a financier before, but I’m astonished at how tasty they are and how easy they are to make. Financiers are small French cakes that are based on ground almonds and are normally baked in small rectangular cake tins which make them resemble bars of gold. Hence the French name ‘financier’. They are light and airy, but remain moist upon cooking and last for quite a while in the biscuit tin. I don’t have a cake tin that resembles anything like a gold bar so I just baked mine in a mini muffin tray and they turned out brilliantly. Now, I’m going to ‘fess up here. I screwed up the first batch I made. It was such a simple mistake, but one that could have been avoided if I’d been focusing more on double checking the ingredients. Basically, I used salted butter instead of unsalted, but this meant that when it was added to the 1/2 tsp of salt the original recipe required they were massively over-salted, to the extent that when I first tasted the financiers I spat them back out because they were far too salty. Joking aside, if you enjoy a sweet treat, particularly one that’s packed with almond flavour, then this is the recipe for you. Although they’re based around ground almonds, a portion of one financier contains just enough almond to keep the cakes low FODMAP. After baking, the financiers turn out as sweet, rich little almond-scented cakes that are enriched with browned butter and dark cocoa powder. They’re not dairy-free because I really think you need the flavour of the browned butter to be true to a traditional financier, but they are gluten-free. However, if you’re dairy intolerant you could certainly have a bash at making them with dairy-free butter. You’ll still get a tasty almond cake, but it will lack the butter flavour. Whatever way you decide to make them, I’ll bet you give them a thumbs-up. Preheat your oven to 190C/170C Fan/375F/Gas mark 5. Grease and flour your mini muffin tray so the financiers don’t get stuck inside upon baking. Place all of the ingredients into a mixing bowl and add the browned butter. Lightly beat the egg whites and then fold them into the mixture. Place a heaped tablespoon of mixture in each mini muffin tray section and bake for 10-15 mins.